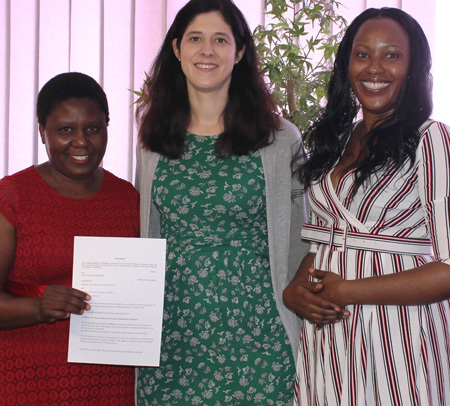 Lidar Community Foundation recently signed a funding agreement for a financial support amounting to N$420,500 (Euro 25,000) through the micro-project fund of girl empowerment by the German Embassy. The agreement was signed by the German Deputy Head of Mission Ellen Gölz together with Serley Dena Khaxas, Executive Director of the Lidar Community Foundation, and Joyce Aevarsson, Executive Member of the foundation. According to Khaxas, the Lidar Community Foundation runs a centre in Damara Location in Katutura that takes care of vulnerable girls. Most of them have lost their parents, are homeless or teenage mothers. The funds will be used for renovation, equipment and training measures. The renovation of the centre will entail the equipping of some rooms with furniture for consulting and study purposes and one room to be utilized as an emergency shelter to accommodate girls on a short term basis. New kitchen equipment will be purchased as vital element for baking and cooking courses offered on a regular basis. As training measures, the centre furthermore organises courses on sexual health as well as on nutrition, hygiene and disease prevention. For vulnerable girls and young women, the centre is a chance to a higher quality of life. Through education and guidance, Lidar Community Foundation strengthens them to take their future into their own hands and encourage them to accept responsibility. Caption: Serley Dena Khaxas (Executive Director of Lidar Community Foundation), Ellen Gölz (German Deputy Head of Mission), Joyce Aevarsson (Executive Member of Lidar Community Foundation).